Another view of Western National's Laira depot at Plymouth where a couple of ex LT DMS types are being readied for further service for WN. Notice the differences to the bodywork of these two, the one to the left has Park royal bodywork, the one on the right has MCW bodywork. Also keeping them company are a Bristol LH with Plaxton body(3409), and an ECW RE which appears to be 2737 (STT735H). In the background to the left can seen the top of one of the DMS types already painted green. 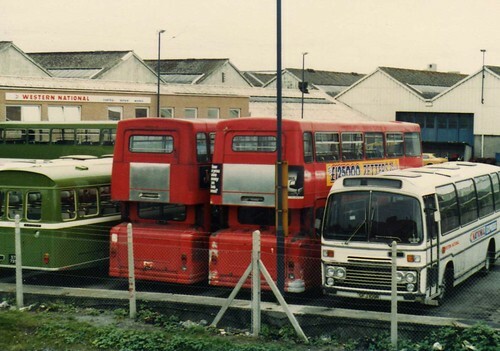 Aecregent is now starting to post some more Plymouth Citybus photos from the eraly 1980's so pop over and have a look!